SkyBound USA was founded in 2009 as a company providing trampoline replacement parts. Now it is well-known brand designing innovative products for the whole family. The market is flooded with variety of trampolines. Skybound has its mark well traced among all. Because of versatility as well as technology used in manufacturing the parts it makes Skybound trampolines more safe and reliable. Apart from this, what makes Skybound trampolines worth the name is the diversity in shapes and sizes. 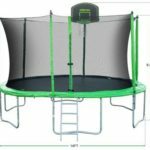 These trampolines are of various shapes like oval, round, hexagonal, and octagonal trampolines. These trampolines come in sizes of 10 feet by 14 feet oval and 11 feet by 16 feet oval. They are equipped with a new enclosure system which curves outwards and does not require nuts, bolts, or washers to set up. Among all the trampolines out in the market, Orion is supposed to offer a great bounce. 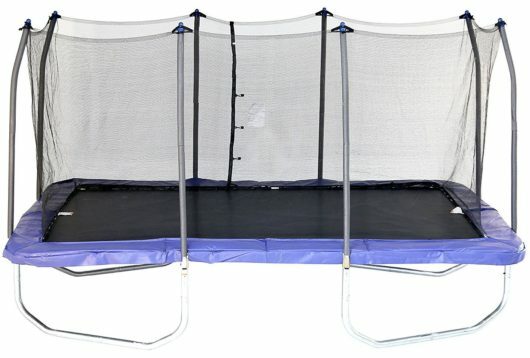 Skybound Orion trampolines have their nets outside of the spring covering the exposed spring with a wider spread. These trampolines are most compact and are designed to fit in very confined spaces. This limits the age group to kids only. 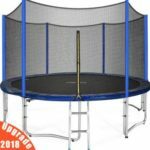 Although the small size, this trampoline may be Skybound’s best yet – its enclosure net is double-layered and sewn into the jumping mat for safety. One of the key features that Atmos offer is the curved single legs that are mounted with rubber feet that offer slightly more stability and a lot more traction on uneven surfaces. 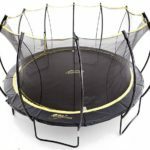 The Mini 4 Children trampolines as the name suggests are smaller 3-foot trampolines that can be used for feeble exercises. These are meant for children and can carry weight up to 100lbs. It comes with a handlebar for balance and 5 straight rubber-capped legs. It doesn’t contain net at all; as well it is not intended for higher jumps. 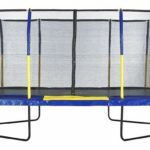 Stratos is one of the most popular Skybound trampoline. It comes in three sizes – 12 feet, 14 feet, and 15 feet. This trampoline can withstand the sun and the net is attached to the net so that one doesn’t fall.